Enjoy our version of Macbeth. Listen to this gruesome tale and you'll learn 12 different ways to use the word 'out'. The English word out has many meanings and uses. In this session, we bring you BBC Learning English's own version of the Shakespeare's Scottish play, Macbeth. You'll see we've found many ways to use the word out in it. As you watch part one of the story, listen out for the different uses of the word out – and decide whether this summary of the story is correct or wrong: Macbeth has committed a murder and is worried that everyone will find out. Hello, I'm Mariam. Today's story was written as a play hundreds of years ago and is sometimes known as the Scottish play. It involves fighting, witches and a man called… Macbeth! We begin with three cackling witches who are meeting Macbeth, a Scottish nobleman who's been out fighting in a great battle. The witches predict that he will become Thane of Cawdor and King of Scotland and that the descendants of his friend Banquo, will become kings – what a prediction! Banquo thinks this a joke but Macbeth is excited by the idea and guess what? Macbeth is actually made Thane of Cawdor by King Duncan, as a reward for his bravery. Macbeth's wife, Lady Macbeth, who's back at home, hears of the news and decides to set out to help him become King too by any means she can. Firstly, she persuades him to kill King Duncan. Macbeth does this by stabbing him in his sleep. Nobody else knows who committed this murder and so Macbeth is crowned King of Scotland. So two out of the three witches' predictions have come true – but he's worried that the third prediction, about Banquo's descendants becoming kings, will also become true. So, cruelly, he attempts to kill his friend Banquo’s son. However, Banquo's son escapes. Then Macbeth is haunted by Banquo's ghost and receives worrying predictions from the witches. Everything swirls around in his head and he is out of his mind with worry and fear that the truth about what he has done will get out. Well I'd go mad if all that happened to me. Well things go from bad to worse for Macbeth, as you'll find out if you join me again for part two of the story. See you again soon. How was that? The summary was right. Lady Macbeth persuades Macbeth to kill King Duncan – he goes out of his mind worrying that news of this murder will get out and everyone will know it was him. Why don't you set out to improve your English? Have a go at our quiz to check you know the first set of out vocabulary. Let's check your understanding of the story - and the words and phrases with out. Decide whether each statement about the story is true or false. Look at the vocabulary box if you need help. Mariam tells us that "The witches predict that he will become Thane of Cawdor and King of Scotland..."
Macbeth is the King of Scotland. What's the meaning of 'set out'? Lady Macbeth decides to start helping Macbeth to become King of Scotland. Mariam tells us that "two out of the three witches' predictions have come true..."
The witches' predictions all come true. He's 'out of his mind'. Macbeth is so worried that he can't deal with the situation properly. What does 'get out' mean? Macbeth is worried that the truth about what he has done will become known. Want to find out what happens next? 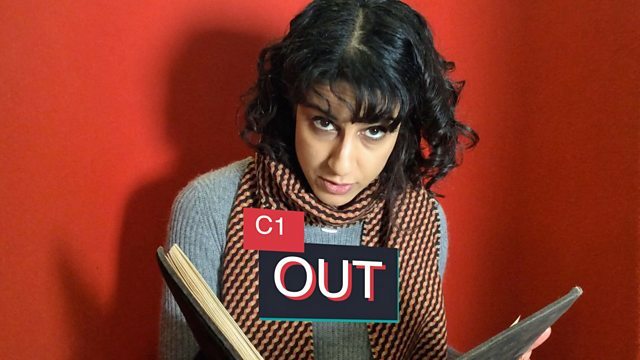 Mariam tells part two of the story – and finds more uses of the word out.